Founded in 2012, Indexed I/O has continuously developed and provided cutting edge eDiscovery technologies to the legal world. It is the first truly purpose built, end to end, fully automated, eDiscovery SaaS platform in the industry..and others are scrambling to catch up. SaaS eDiscovery: We invented On-Demand eDiscovery! From the start Indexed I/O’s focus was to bring advanced legal eDiscovery technologies to everyone. Making them not only accessible any where in the world, 24/7, but making them intuitive and easy to use. We have more experience providing secure, cloud-based eDiscovery solutions than any one. Others may be trying to catch up by forcing their pre-existing software into the cloud, but Indexed I/O was born there and has always leveraged its security, scalability, and affordability. We have provided our users with a fully functioning DIY end-to-end eDiscovery solution from day one. Contact us for a 10 minute demonstration of Indexed I/O. That’s it. If after the seeing it in action you aren’t convinced it is a fit for you then we all move on. Come on, isn’t it worth 10 minutes to find out if you could be saving time, money, and eliminate your eDiscovery stress? We empower you to change how you prepare for discovery, process your client data, and cull/analyze your documents during early assessment and review. Our technology targets information at its earliest stages of an engagement to fully process all items in real-time while enabling you to run searches, cull and filter via our advanced analytics. This includes easy-to-use interactive charts and graphs, as well as review for production downstream. Indexed I/O Corp is a developer of high-speed, cost-effective data processing and analytic solutions. Its product is targeted to Corporate Counsel, Law Firms, and IT Departments requiring eDiscovery services for litigation. Founded in 2012, Indexed I/O’s eDiscovery solution includes data processing, data culling, document review and tagging, and exports/productions. Indexed I/O offers state of the art ‘more like this’ search capability as well as traditional search and language analytics. 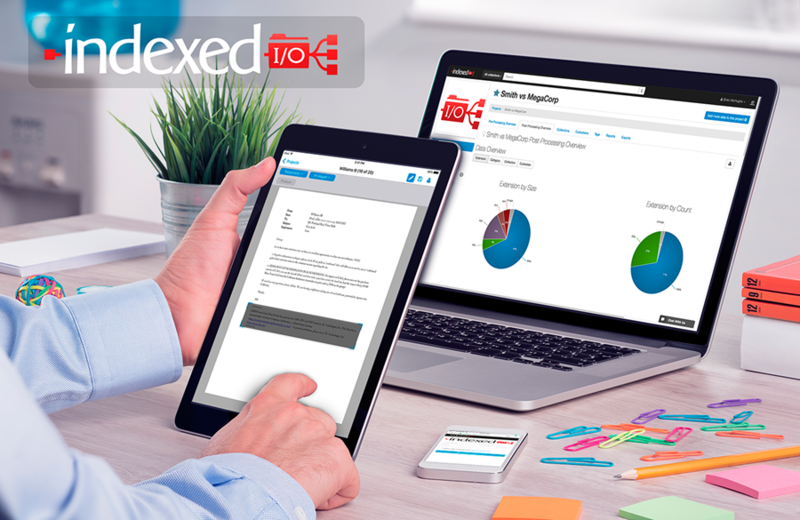 With an easy and intuitive interface, legal teams can quickly learn and utilize Indexed I/O in a matter of minutes. With no software or hardware to purchase, a ‘pay for what you need’ model, and no-long term restrictive contracts, Indexed I/O is by far the fastest, easiest to use, and cost effective eDiscovery solution.